I love my GUI interface on Kubuntu. I love to listen to music with Audacity as I plunk around making clipart or writing or learning to code in Python. A computer is a big part of my life. It’s true that there is proprietary accessible software to help blind and low vision people access a computer, but the average cost of this software is around $900. Since 90% of blind and low vision people live in developing countries, how are they supposed to afford this? One answer is using the power of the community. There are great coders out there. They love contributing their skill and they are doing so. Jonathan is trying to put together a really great distribution targeting the needs of those with any disability that limits their access to computer power. The Sonar Project is that distribution. There is a lot of work needed to organize, build, expand and deliver a FOSS distribution. FOSS may be based on Free Software, but the work takes away from other jobs that pay. Burning CDs, printing manuals, all that sort of thing takes more than dedication, too. You may have students in your school, or even children of your own who would benefit from a FOSS distribution that serves them. FOSS projects depend on a strong, dedicated, vibrant and supporting community. Even if you are not a coder, you can be involved, and you can make a difference. By the way, if you are going to the Northeast LinuxFest this spring, stop by to say hello. I’ll be at the KDE table. As part of my PLN (Personal/Professional Learning Network), I follow several people on Twitter. Sometimes they provide direct insight. Sometimes, too, they provide links. I am grateful for both. Today Ana Cristina Pratas (@AnaChristinaPrts) gave a link to ClipArt ETC which the tweet identified as “Free Educational Illustrations for Classroom Use”. Her link is to her own ScoopIt account and from there it is a click on the popup title to the original site. On the ClipArt ETC site, The University of South Florida is offering clipart for “free” educational use. They have terms that limit a person from using the clipart commercially without paying them. They also limit a single student/teacher project from incorporating more than 50 clipart items under their free use terms. That sounds pretty liberal until you examine some of the clipart they are offering. This image is like many I’ve seen. It is a good illustration of a leaf sliced through, as viewed through a microscope. It would make a great handout or presentation slide, maybe talking about chlorophyll and photosynthesis. You can download in several sizes. Wonderful. Botany unit booklet, here we come. Back to the licensing. They ask that any use of the image be credited back to them as the source. No problem there. But, I examined the illustration’s meta data that they provide. 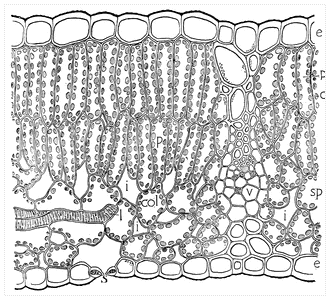 It turns out that this image is from a botany book published in 1914: Nature and development of plants, by Carlton C. Curtis. That would put the book and its illustrations into the public domain, as far as I can tell. Now, I don’t have any problem citing the ClipArt ETC site and The University of South Florida. Making sources easier to find by others who read through my classroom projects is a great thing to do. The problem I have is that OER (Open Educational Resources) have a tough enough time being put together. If I were to put a botany unit together, I might actually wind up using more than 50 of the good illustrations I found at ClipArt ETC. Botany is a pretty broad topic. It bothers me that I’d be in technical violation of the site’s term, in spite of the fact that many clipart documents found there are in surely in the public domain and are legally not subject to terms like the ones on the site. If they have copyright clearance for much of their collection to offer rights-restricted works by their terms, great. That would help teachers and students with their projects. If The University of South Florida is ADDING limitations, then not so good, not good at all. In your attempts to develop your own OER projects, keep things as truly free as you can. Cite your sources. Give the requested credits, but demand more openness from sources than they currently want to give. Be persistent. The cultural commons doesn’t belong just to someone else. It is also yours. You might also want to check out The Public Domain: Enclosing the Commons of the Mind by James Boyle. It is available at the linked site as a pdf download in addition to being able to purchase a hard copy. Open Courses at the university level are making news (I’m still working on my own Python experience with the P2P MOOC). 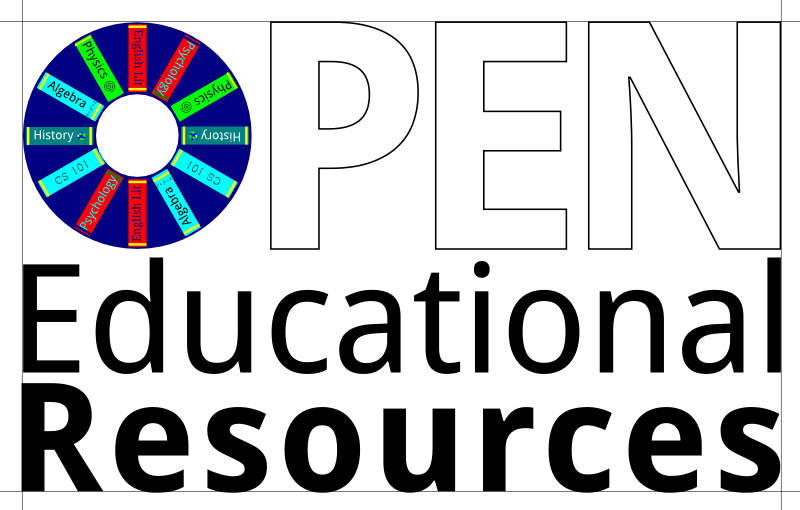 Open Educational Resources are beginning to make an impression in K-12 education, too. K-12 isn’t the hotbed of Open Education (yet), but you still will probably find this “year in review” article at opensource.com interesting. Carry on…satisfied with the status quo?